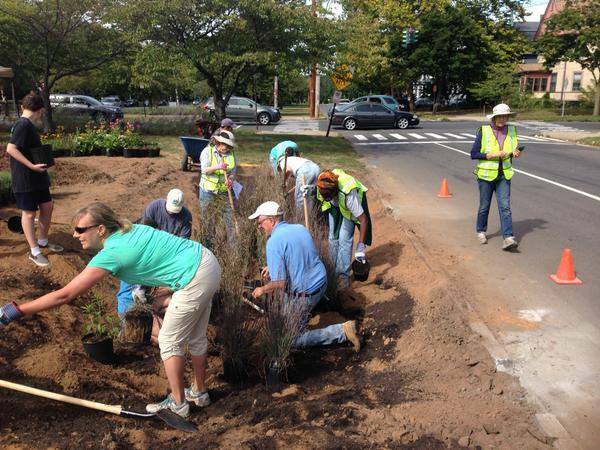 A Gorgeous Day for a Rain Garden! 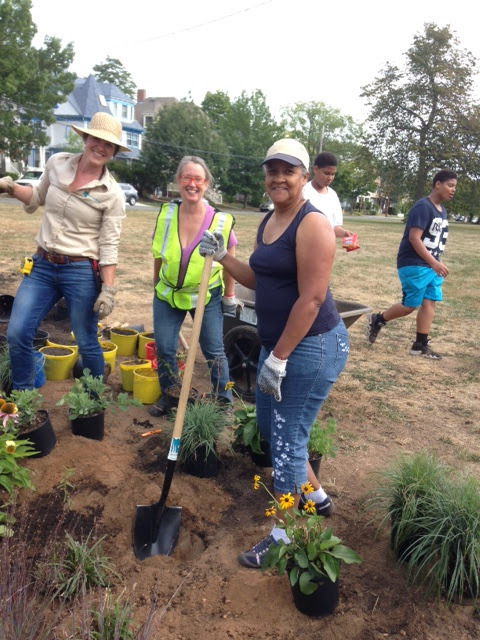 On Saturday, September 26th, NHS staff member, Kathy Fay, took part in a rain garden event on Edgewood Avenue, sponsored by Save the Sound. It was a truly fantastic event with many volunteers from the neighborhood helping out. Thanks to all of their incredibly hard work, there are now two new bioswales (large rain gardens) on either side of the Edgewood Mall on Ella T. Grasso Blvd, filled with hundreds of plants. 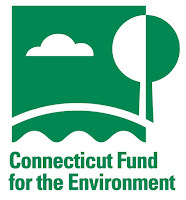 When it rains in New Haven, the rain water flows over the streets, sidewalks, and other impervious surfaces, picking up harmful pollutants and causing localized flooding. During some storms, this polluted runoff (called stormwater) inundates our storm and sewer pipes, causing raw sewage and polluted stormwater to overflow into the rivers. 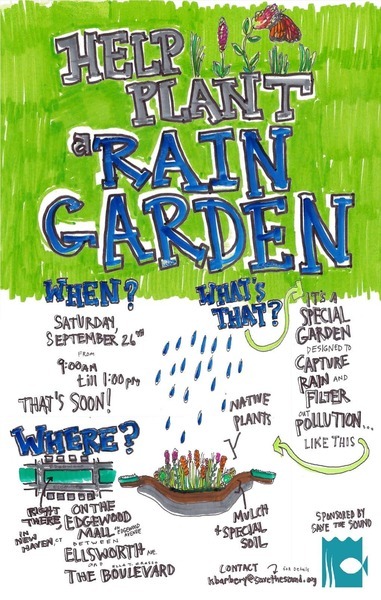 The purpose of installing rain gardens is to capture the rainfall and allow it to soak into the ground. This will help to prevent flooding and water pollution, and allow clean water to reach our rivers. One great surprise during the event? Our NHS Board President, Virginia Stevenson, just happened to be driving by and decided to join the volunteers and help out the project. To stay updated on further Save the Sound projects and events, follow them on facebook here. 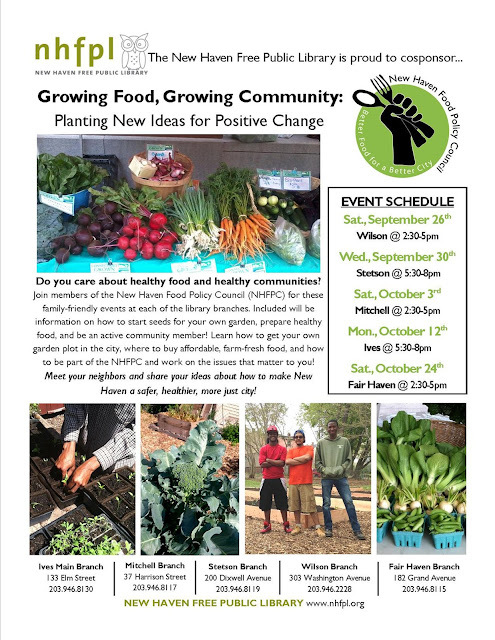 Growing Food, Growing Community. New Haven Public Libraries Offer Family-Friendly Events! Do you care about healthy food and healthy communities? NHS would like to help spread the word about upcoming family-friendly events planned by the New Haven Free Public Library and the New Haven Food Policy Council. Included during each event will be information on how to start seeds for your own garden, prepare healthy food, and be an active member of your community! See the flyer below for the dates/times that your local library will be participating or visit www.nhfpl.org! LAUNCHING A NEW HOME MAINTENANCE SERIES! There is a definite chill on the East Coast today! Some of us woke up looking for our sweaters and light jackets! It certainly looks like September has arrived in full force and we have just the classes to help you through it! 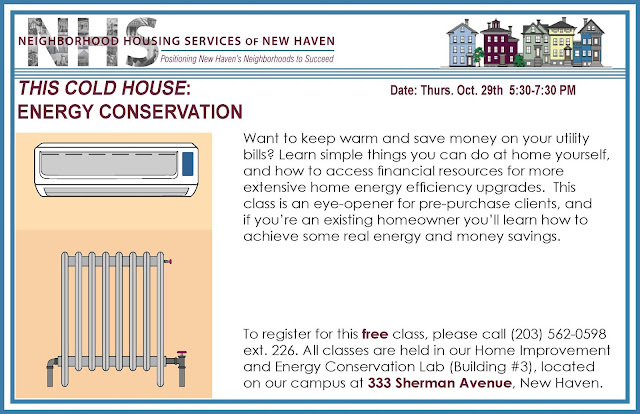 NHS of New Haven is proud to announce our brand new series, This Cold House, to our home maintenance classes! Of course, some of may not like it, but we can no longer deny that winter is coming. We want you to stay warm and comfy the entire season. 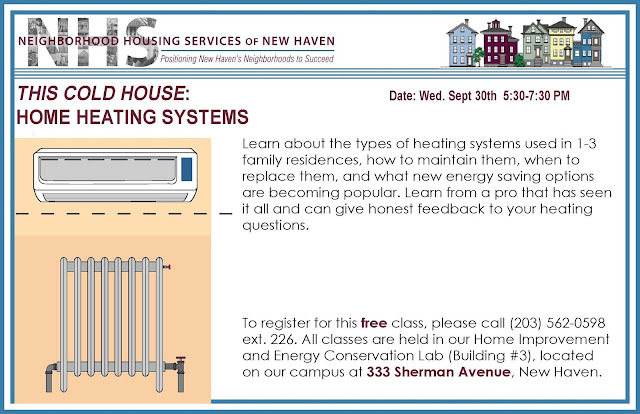 Our home maintenance classes will teach you the ins and outs of keeping your home the perfect temperature all season long. Whether it is about home heating systems, energy conservation, or yet-to-be announced topics in early 2016, we invite you to stay toasty without breaking the bank! And of course -- all of our classes are 100% free and open to the public! 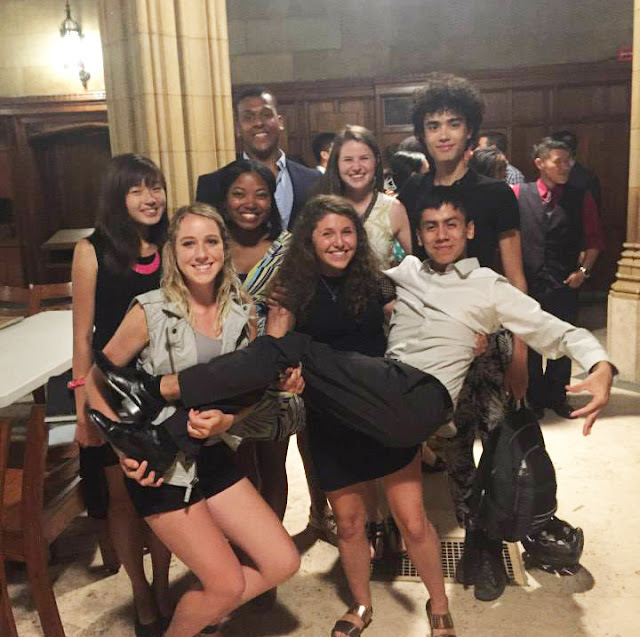 On the morning of Monday, August 24, a group of about ten Yale students arrived at NHS of New Haven's campus. They were about to begin their week of service through Dwight Hall’s FOCUSon New Haven program, which at the end of every summer sends rising sophomores and upperclassmen group leaders to work with local nonprofits and see the city from a different perspective. The students who came were led by Lauren Blonde, an architecture major and a friend of NHS, who was returning for a third consecutive year of working with us through FOCUS. The group was set to work in the community garden on Ivy Street for about twenty hours, Monday-Thursday, with many items lined up for them to do during their time. 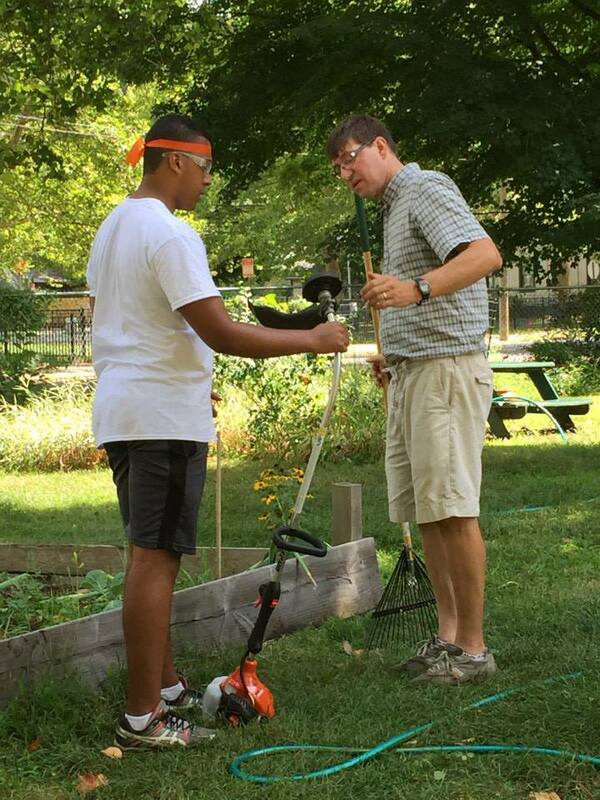 First off: the garden needed general upkeep. 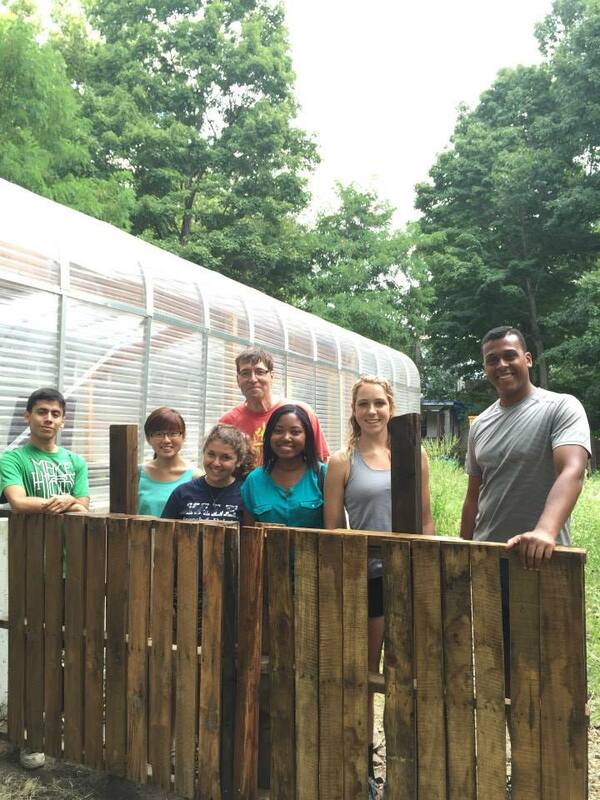 The students, alongside NHS' Community Building & Organizing team, watered, weeded, and picked up trash. There were tables and chairs that needed painting and staining, as well as a broken umbrella pole that needed to be replaced. 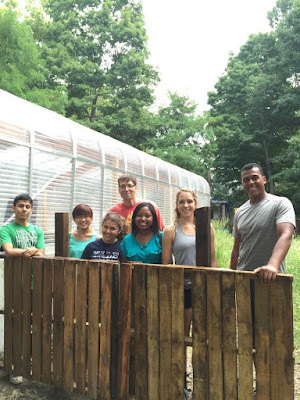 Our largest project was the construction of a fence adjacent to the greenhouse. The space between the greenhouse and the neighboring property is currently unused and full of weeds, wildflowers, and rocks, a waist-high wilderness we needed to weed-whack to traverse. While having the pleasant appearance of a natural meadow, it needed maintenance and was not a good first impression of the garden when entering from the Shelton Avenue gate. The solution devised by Lauren and CBO director Stephen Cremin-Endes was to use some wooden pallets leftover in the garden to build a fence. We would dig holes, mix concrete, and erect posts cut from spare four-by-fours. We would then attach, vertically, the newly sanded and oiled pallet. When all was said and done, it would look like a slatted fence, running from the corner of the greenhouse to the edge of the property. Eventually, another will be built on the other side of the wildflower garden. 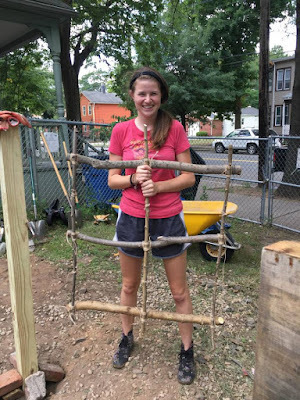 One student even used her Girl Scout expertise to lash together a fence with branches and twine to be attached when a hinge was installed. I, myself, arrived on Tuesday, as the project started in earnest. A few students sawed fence-posts, others dug holes, and others coated the tables with linseed oil. After digging the holes and cutting two four-by-fours, we played around with concrete until the posts were safely set. The rest of the concrete was used for found-object art. The next day, we dug more holes for new posts and started to attach pallet to the ones we installed the preceding day. The wood, however, was treated and well-weathered, and it was almost impossible to drill through the four inches, let alone put in a screw. But throughout all of Wednesday and Thursday, with some experimentation, some frustration, some exasperation, some cooperation, and a great deal of physical exertion, the pallet were up. The front fence was close to finished and the part already constructed was sturdy and visually appropriate. A beautiful handmade gate was made with twine and expertise, soon to be attached. By the time all of our work was completed, it was Thursday, time for the volunteers to take their leave. We took a group photograph and there plenty of friendly chatter as they helped pack up to go. Speaking with them, I found that the most common sentiment among them was gratefulness for or interest in seeing New Haven from a different perspective. The garden, once again, looked clean and healthy. That evening, all the FOCUS students met for a large dinner at Dwight Hall. Stephen and I were invited, along with representatives of other non-profits, and were served a menagerie of delicious New Haven takeout. But the most important thing was that we were able to thank our volunteers once more for their dedicated service. We enjoyed working with them and hope to see them again soon. HomeLIFT Initiative a Great Success! 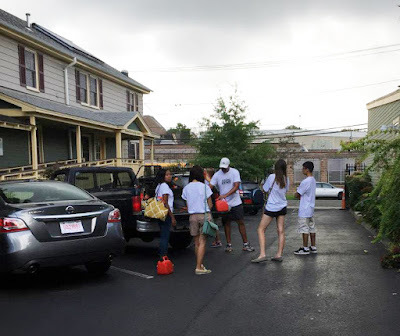 On August 28th & 29th, NHS of New Haven took part in the HomeLIFT Initiative, a collaborative effort between Wells Fargo and NeighborWorks America. 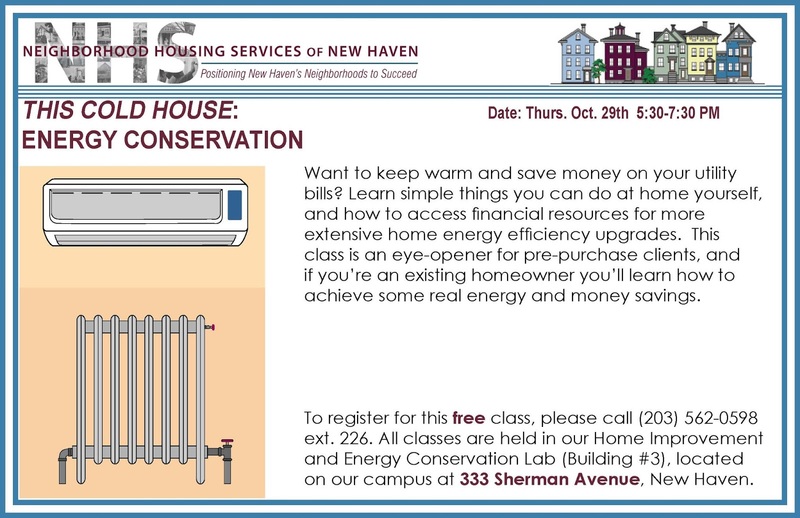 The program provides $15,000 down-payment assistance grants to homebuyers looking to purchase a home in New Haven, East Haven or West Haven. You can learn more about the program here. The HomeLIFT event in New Haven was a great success. We were able to provide information, education, and support to people who were looking to make homeownership a possibility. In all, during the launch at the Omni Hotel in New Haven, there were close to 700 guests who were either pre-registered or attended as walk-ins. 176 grants were reserved by customers at the event -- totaling nearly $2.6 million in down-payment reservations. In addition, a virtual "Affordable Home Tour" was featured during the event -- providing customers the ability to see a sampling of over 100 affordable homes in the Greater New Haven area. Finally, during the event, NHS was one of four non-profits that hosted a booth, providing lots of information about our services. 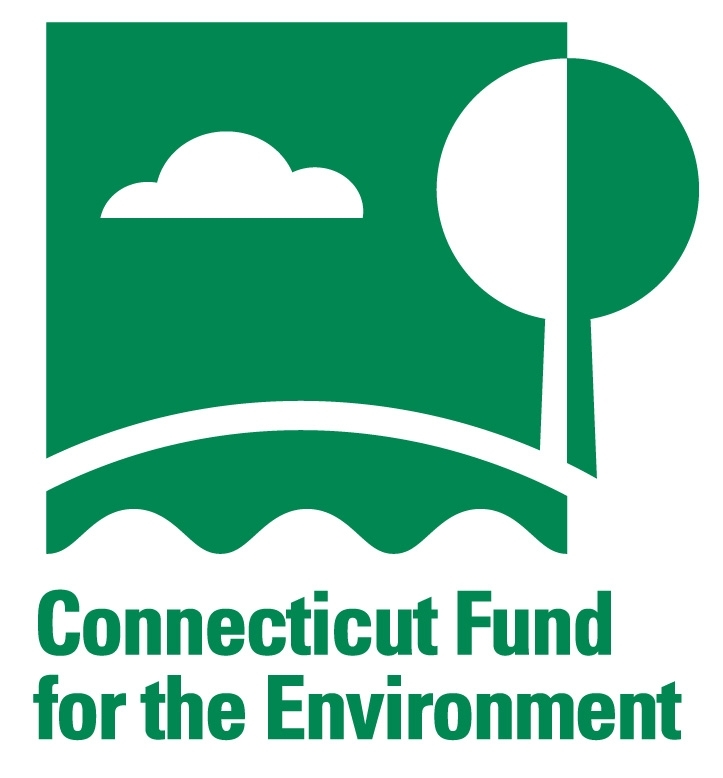 The other non-profits were the City of West Haven, CT Community Development Administration, the CT Housing Finance Authority, and the Housing Development Fund. NHS Executive Director, Jim Paley, alongside Kim McKoy, after she has reserved her reservation letter! A few weeks back, we posted an article on the draft West River Watershed Plan -- here is that post, in case you'd like more information. 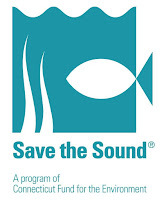 We're happy to announce that the West River Watershed Plan is now live and ready to view on Save the Sound's website. You can find information on the plan, as well as all technical memos and appendices there. Please feel free to share the plan with friends, neighbors, and colleagues! September 1st! Join the GoNewHavenGo Contest! Happy September! It is time for the annual goNewHavengo transportation contest! Last year, the Healthy City Healthy Climate Challenge started goNewHavengo in partnership with NuRide, CT DOT and the City of New Haven. NHS participated in the contest and won first place among the participating organizations, and many NHS staff were also winners in individual categories! This year we are thrilled that the City of New Haven has taken the lead on goNewHavengo is running not just the contest, but lots of related events during the entire month of September. The contest involves logging onto NuRide http://www.nuride.com, and tracking any trip you take that includes carpooling, walking, biking, or using transit. In addition to the contest prizes, NuRides awards great coupons for those who log their trips, and you can continue to reap the NuRide rewards even after the September contest ends. Log on to goNHgo today to join the challenge and support this incredible initiative! NHS of New Haven is one of the founding organizations of the Healthy City Healthy Climate Challenge, which aims to encourage behavioral change that is healthy for you and the planet, by focusing on five areas where we all make individual choices: transportation, food, electricity, waste management, and communicating to make policy changes. Many of us aren’t even aware of the impact these choices can make on reducing greenhouse gasses, and sometimes we don’t even know we have choices in all these areas that are easy, inexpensive, and impactful. Join us! Take this simple 5-step pledge and you can reduce your personal carbon footprint by 20%!